GIS in the Rockies is the Rocky Mountain West’s premier geospatial information and technology conference and attracts a large, professional attendance base. Exhibitor exposure is maximized with attendees passing through exhibit area for sessions, meals, and breaks. We suggest you register early! Exhibitors registered and paid by May 31 receive a discounted booth price and are highlighted in the preliminary program sent to more than 6,000 GIS professionals. Booth are expected to sell out, and locations are prioritized based on payment date. GIS in the Rockies is the Rocky Mountain West’s premier geospatial information and technology conference and attracts a large, professional attendance base. The conference program and venue layout maximizes attendee presence in the exhibit hall, with meals and coffee breaks in the exhibit hall and sessions in adjacent rooms. We suggest you register early! 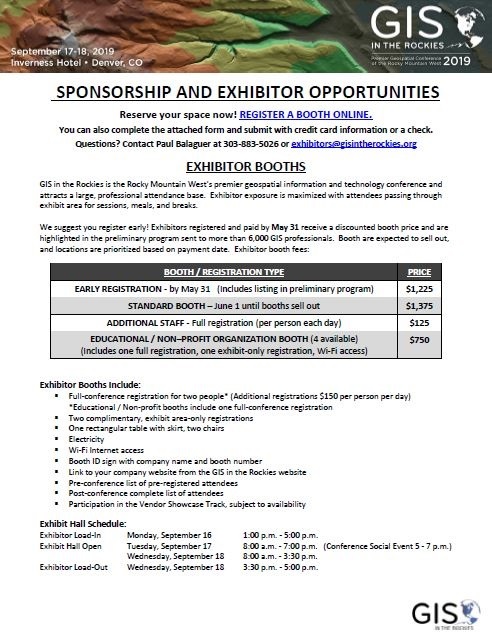 Exhibitors registered and paid by May 31, 2019 receive a discounted booth price and are highlighted in the preliminary program sent to more than 6,000 GIS professionals. Booth locations are prioritized based on payment date.